A little something I made for Thunder Dragons, since that's the hot new thing, it's an Xyz Monster that is easily Summonable, should you have a Thunder monster, but works for non-Thunders as well if you want to farm out Tokens, though be careful that you can use them right away, since you can't use non-Thunder monster effects while you control one of them. It doesn't have a lot of ATK, it's designed to not be able to tackle the Tokens it Summons right way, but have a high DEF instead, though you probably are going to swap this out for something else. 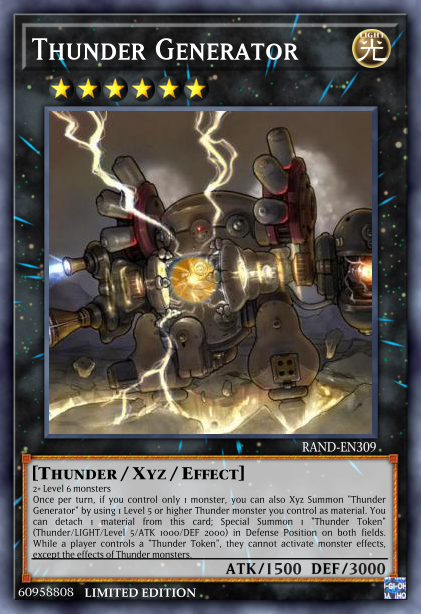 Once per turn, if you control only 1 monster, you can also Xyz Summon "Thunder Generator" by using 1 Level 5 or higher Thunder monster you control as material. You can detach 1 material from this card; Special Summon 1 "Thunder Token" (Thunder/LIGHT/Level 5/ATK 1000/DEF 2000) in Defense Position on both fields. While a player controls a "Thunder Token", they cannot activate monster effects, except the effects of Thunder monsters.